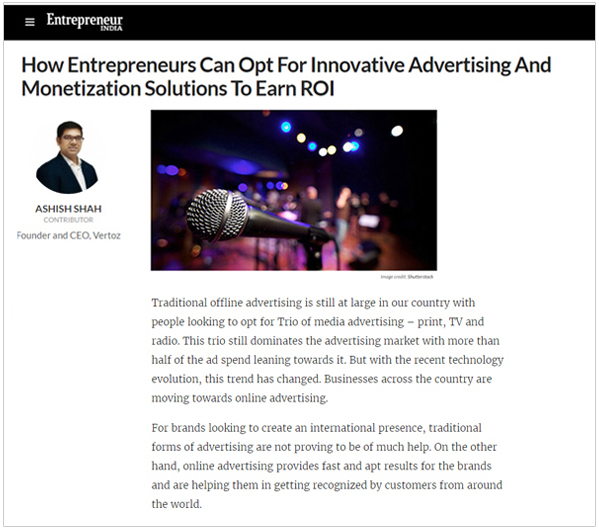 Our CEO, Ashish Shah is sharing thoughts on how entrepreneurs can choose innovative advertising and monetization solutions over traditional methods. With the recent technology evolution, the trend of traditional offline advertising has changed. Slowly all the businesses across the country are moving towards online advertising. Nowadays, brands are looking out for an international presence and traditional forms of advertising are not proving to be of much help. So, the flow of online advertising is delivering fast and apt results for the brands and are serving them in getting recognized by the customers from around the world. The Franchise India Holdings Limited is Asia’s largest unified franchise solution company since the year 1999, and they are the specialist in franchising and licensing. Entrepreneur India is a part of Franchise India Holdings Limited. It has helped hundreds of investors in selecting the right franchise and, in turn, assisted numerous organizations in franchise expansion. Vertoz is a leading programmatic company that offers engaging and innovative advertising and monetizing solutions. Our ingenious platform, proprietary technology and advanced capabilities empower a global roster of top advertisers and publishers all under one roof. We want to upgrade our technology to make it more user friendly and build strong partnerships with others.